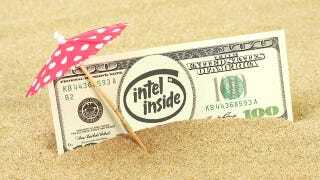 Thanks to a settlement in a long-running class-action lawsuit, Intel is now offering fifteen shiny dollars to anyone who bought a Pentium 4-powered PC almost fifteen years ago. One dollar per year of lying and misery that you've had to suffer. The suit hinges on the fact that Intel 'misrepresented' the performance of the Pentium 4 processor, by inventing benchmarks that claimed to show its processor was superior to the rival AMD Athlon Thunderbird. This turned out to be a bunch of crap, and as such a group of lawyers have spent most of the last decade arguing that Intel needs to pay everyone back. The bottom line, thanks to a recent settlement, is that if you bought a Pentium 4-powered PC between November 20, 2000, and December 31, 2001, you're eligible for a $15 cash payout (provided you don't live in Illinois). Notably, there's no need for a receipt — only your conscience (and the dangers of perjury) lie between you and riches.